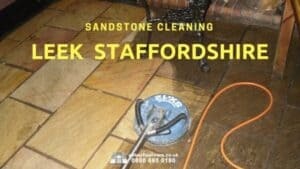 This Sandstone cleaning Long Eaton project arose because my client was searching for advice on cleaning sandstone floors in their home. 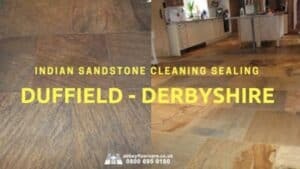 They discovered our Sandstone restoration service online and contacted us about the best way to keep their soiled sandstone floor clean. They had tried some different cleaning methods, including an orbital steam cleaner. 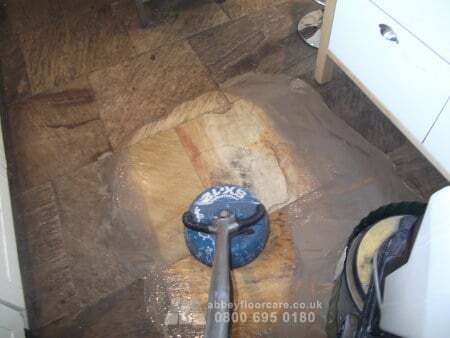 The steam cleaner worked fine on a smooth tile floor, but could not clean the sandstone. I explained that they were not alone in finding their floor challenging to clean. 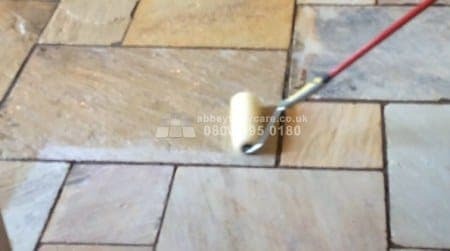 The tiles have a rough, sandpaper-like finish that is difficult to mop and the riven nature of the finish makes cleaning even more difficult. I recommended that the floor is finish sealed with a solvent based surface sealer. The surface sealer makes the rough finish smoother, making it easier to clean. 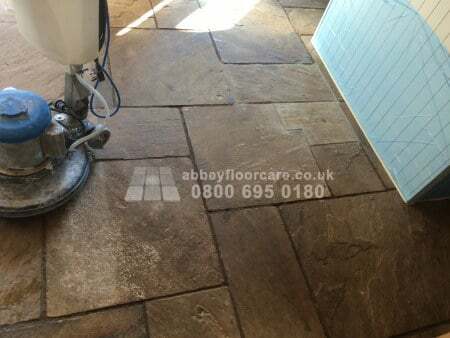 However, I emphasised that floor would never be as easy to clean as a smooth-finish floor. After discussing my proposal, they decided to proceed with my sandstone cleaning and sealing proposal. 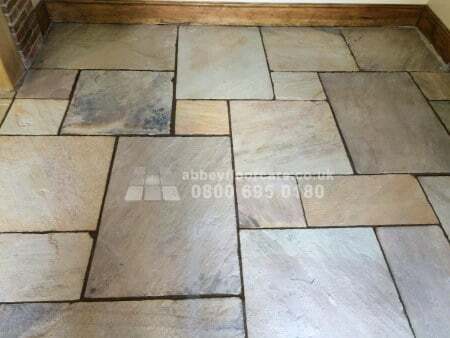 I started the cleaning process by coating the floor with a heavy-duty sandstone cleaner. The cleaner was left for around 20 minutes to start working on the soil. 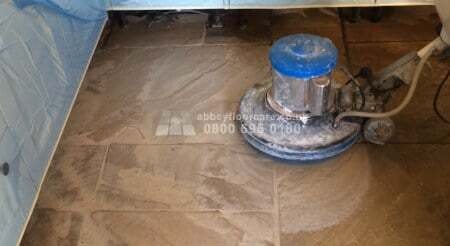 I used a rotary scrubbing machine to agitate the cleaning solution into the surface of the sandstone to help break the ingrained soil away from the pores of the sandstone. My pressurised water rinse and capture equipment did an excellent job of rinsing the emulsified soil out of the sandstone, into a solution tank. I then left the floor for a few days to allow it dry, ready for sealing. 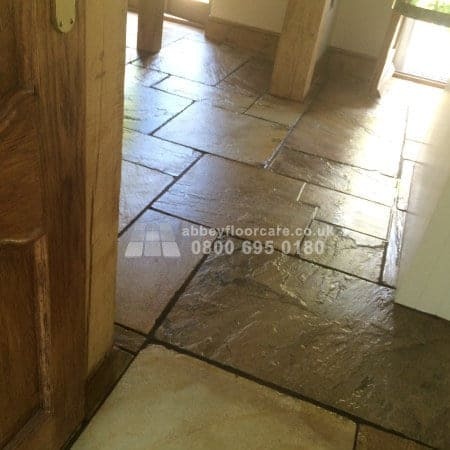 Sandstone is a porous stone, so I applied a coat of impregnating sealer to help prime the tiles and prevent the surface sealer soaking away into the floor. When the impregnating sealer dried, I applied two thick coats of solvent-based surface sealer. 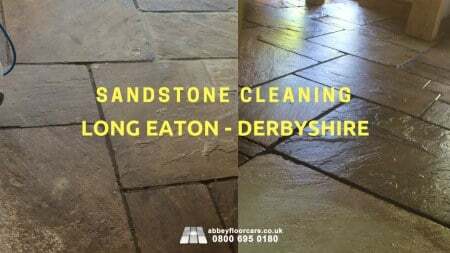 If you are looking to clean a soiled sandstone floor, contact us now for a free, no-obligation Sandstone restoration quotation. 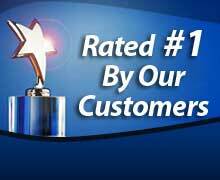 You will be delighted with the results.